Call Us at 602-423-2300 for more information or to schedule your cleaning! Carpet manufacturer’s warranty states you must have your carpets cleaned at least once every 12 to 18 months. They also state that you should be vacuuming once per week for every person in the home (pets count too) in major traffic areas with a CRI Approved Vacuum. So if you’re that good at vacuum maintenance or have a very low-traffic home, you may be able to get away with professional cleaning only once per 18 months. But we live in the real world. I know we should be vacuuming 6 days a week in our living room, halls, and stairs (major traffic areas). However, realistically most people vacuum maybe 2 times a week at most. Because we typically don’t vacuum as much as we should, we should professionally clean our carpets more often to keep it looking good for 10+ years. Once you see soil starting to accumulate in the traffic lanes and vacuuming isn’t removing it, you know it’s time to professional clean them again. For most houses, that’s about every 6-9 months. I know, your pets never have accidents. But they do shed hair and dander, and produce more body oil than you realize. That gets into the carpet. Cooking oils are a major contributor to carpet soiling. Little microscopic drops of oil float around your home, settle in the carpet and grab onto dirt. You’ve been taught no shoes and enforce it with vigor – good job! But if you’re going barefoot, the oil from your feet is getting into your carpet. Both of these fibers are oleophilic; that means they attract oils (are you seeing a theme here?). Fibers that attract oil grab soil more easily and require more frequent vacuuming and professional cleanings. 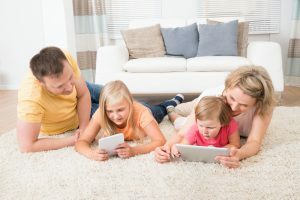 Carpet is the biggest filter in your home and has proven to be the healthiest floor for asthma sufferers when maintained properly (yes, even more than wood and tile). 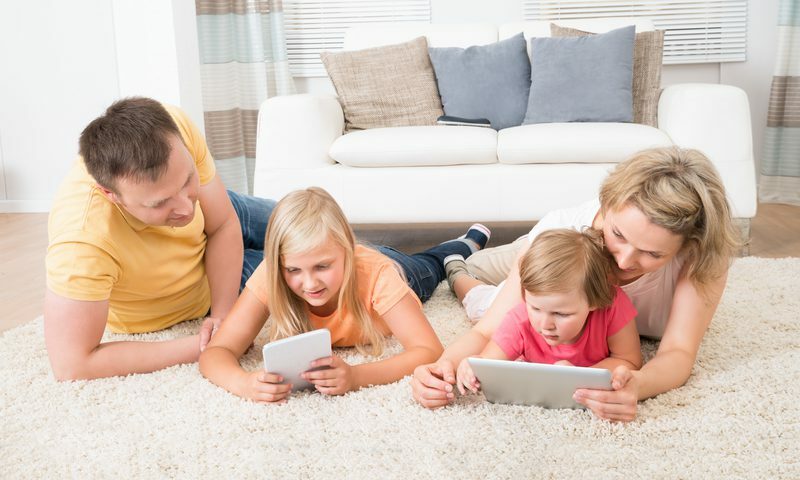 It’s not unreasonable to clean the carpets every 6 months if asthma and allergies are moderate to severe. Carpet companies are amazing at producing fibers that hide dirt. About 10 years ago one fiber producer advertised, “Our nylon looks cleaner 50% longer.” What?! How filthy is it once it starts showing?! Once you see the soil accumulating, permanent fiber damage is occurring. Healthy Living Carpet & Tile is a Peoria, AZ based family owned and operated business. We treat all our clients like part of the family. We are highly trained professionals and are licensed, bonded and insured. Our goal is to provide superior customer and cleaning services while using our all natural and eco-friendly products. We serve both residential and commercial customers in the greater Phoenix metro area.